In our testing lab, we’ve had a considerable number of network storages from different vendors and with a different number of discs. 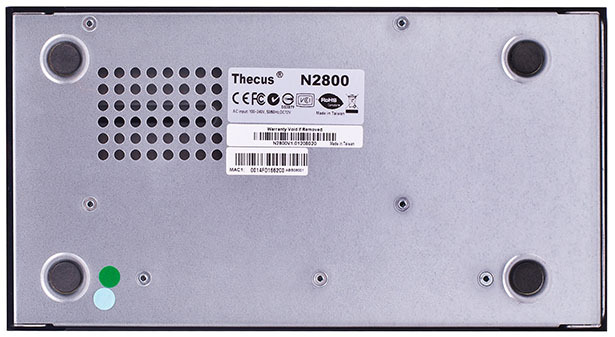 Today we are having a look at Thecus N2800 that accumulated all positive experience the Company has had in developing network storages. For instance, it’s equipped with an HDMI-port which we’ve already seen in the N16000 model; only, here it will be more in place than in the latter. Also, the speeds were surprisingly high. However, let’s not jump ahead of ourselves! 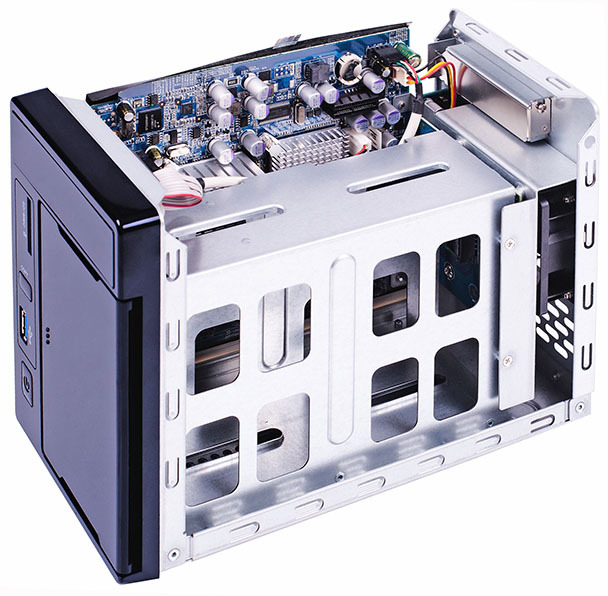 The Thecus N2800 network storage is performed in a metal parallelepiped with a plastic front panel. The device dimensions are 164x116x218 mm. For its operation the model requires an external 12V/5A power adapter. From now on in the photos there’re hard drives belonging to our testing lab. The upper part of the front panel is occupied by status LEDs for the device, its network interfaces, installed discs and the SD-card. Two trays for hard drives are behind a solid plastic door. 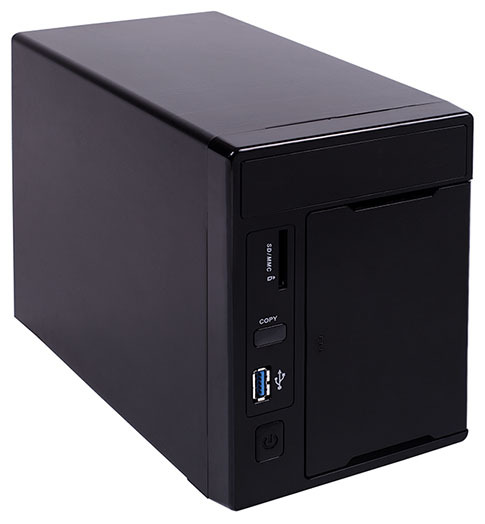 On the left side of the front panel there’s a USB 3.0 port for connecting USB devices, a slot for SD-cards and on/off and COPY buttons, the latter intended for starting back-up data copying from a USB drive. The upper and side walls are quite featureless. 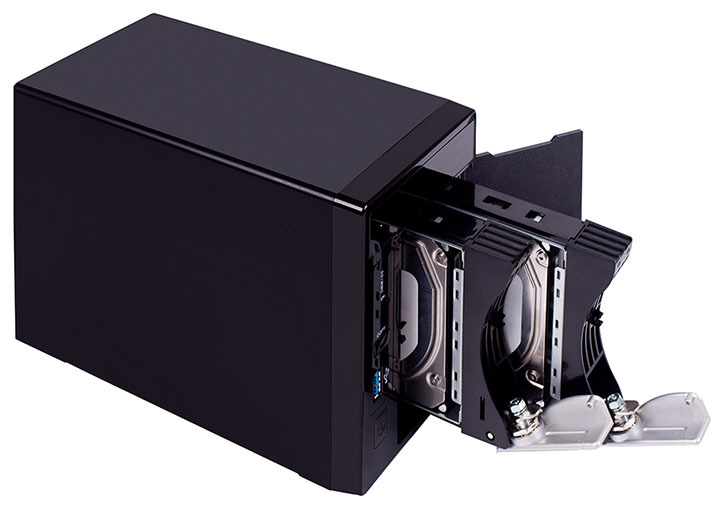 The N2800 rear panel has two USB 2.0 ports, a power slot, an eSATA interface, VGA and HDMI slots as well as two Gigabit Ethernet interfaces. Behind the grate there is a fan for hard drive cooling. Four rubber stands are on the device bottom. Besides, here’re stickers with some information about the device and a ventilation grate. Now let’s look inside the tested model. 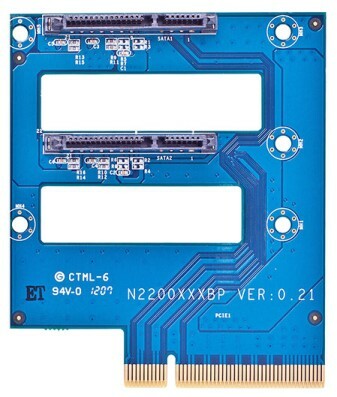 The Thecus N2800 network storage hardware consists of five boards four of which work as adaptors. 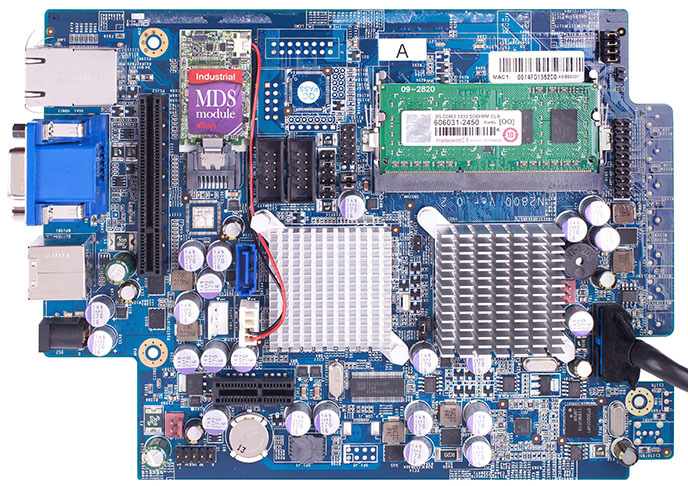 The main board is two-sided and is built on an Intel AF82801JIR I/O controller. The other I/O controller is an ITE IT8728F chip. Intel Atom D2700 of 2.13 GHz is the CPU. 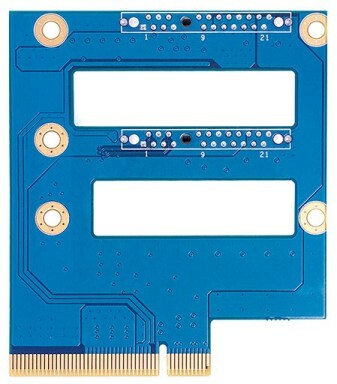 Two Intel WG82574L Gigabit Ethernet controllers provide network operation. 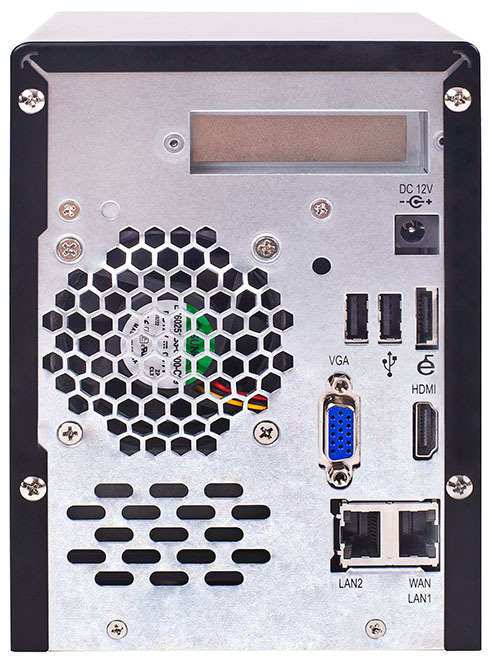 A Chrontel CH7318C controller supports the operation of the HDMI port. Firmware is stored on two 512 Mbytes Samsung K9F4G08U0B chips, i.e. the overall memory available to the system is 1 Gbyte. 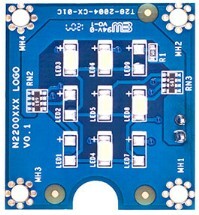 A JMicron JMF601 chip with SATA II interface is used as a controller for these modules. 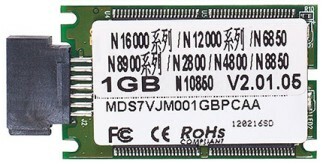 Thecus N2800 is equipped with 2 Gbytes of Transcend RAM built on eight Spectek PRN256M8V79DG9GQF-15E chips (marked PE911-15E). 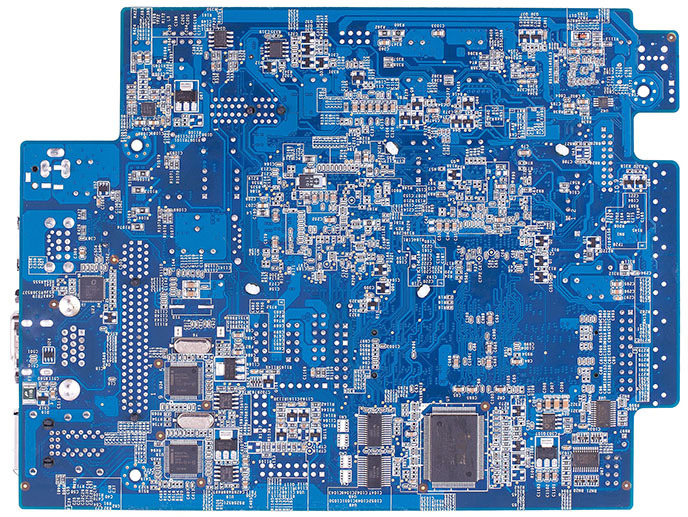 Besides just looking at the boards, information about major elements can be obtained with the help of the “Hardware information” point of the “General” group of the device web-interface. Information about the CPU can be found in the cpuinfo file that is available with the help of the HiSSH module of which we’ll speak later. On the rear wall of the storage there’s a 60x60 mm cooler. We think that bigger blades would be better. The “General” point of the “System information” group in the web-interface provides information about the storage model and the current firmware version. 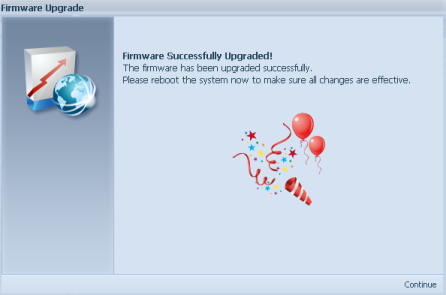 To upgrade firmware one has to turn to the “Firmware Upgrade” item of the “System Management” group, specify the file with the new version image and click “Apply”. The whole upgrade process takes about two minutes and demands rebooting the device. You can search for new firmware versions with the help of the “Online Registration” item of the “System Information” group from where the user will be redirected to the vendor’s site. 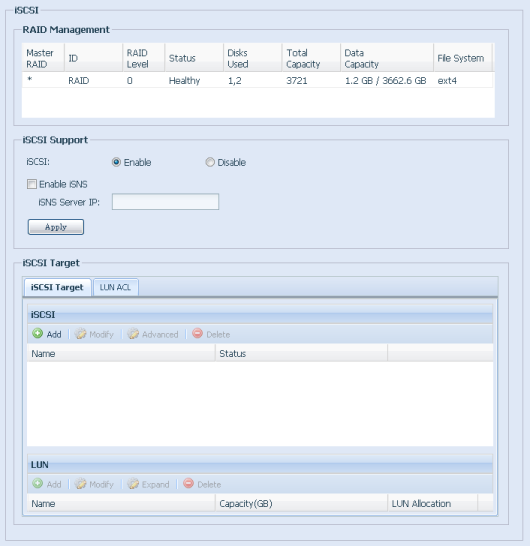 Add-ons are installed and managed with the help of the “Module Installation” and “Auto Module Installation” menu items in the “Application Server” group. 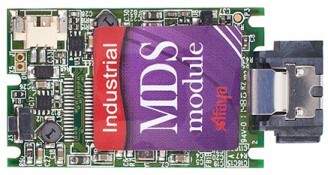 Modules can be installed either manually or automatically. Let’s now move on to the features of the storage web-interface. We’re not going to scrutinize all the features of the Thecus N2800 network storage web-interface; instead, we’ll suggest that our readers turn to our reviews of other devices from the same vendor like 1U4200XXXR, N8800+, N8900 or N16000. 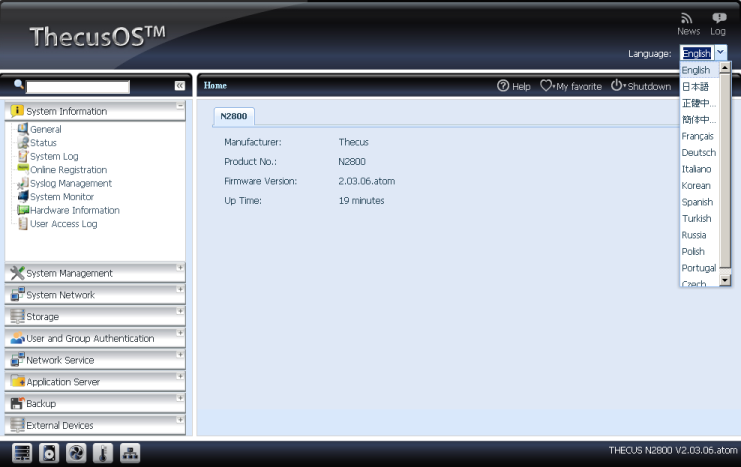 With each new firmware version the Thecus Company adds new functionality to its devices or extends existing capabilities. It’s just about these changes that we’d like to speak in this section. In comparison with previous models that we tested, N2800 gives the administrator more information about its status via the web-interface available in fourteen languages. 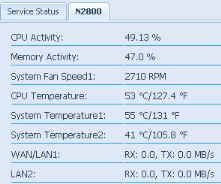 Among these parameters are the following: the temperature of the motherboard, the case and the CPU, cooler rotation speeds, activity of RAM and the CPU, data transmission rates through network interfaces, the device model and the firmware version, the BIOS version and exact models of equipment used (the CPU, NIC’s, USB and RAID controllers). 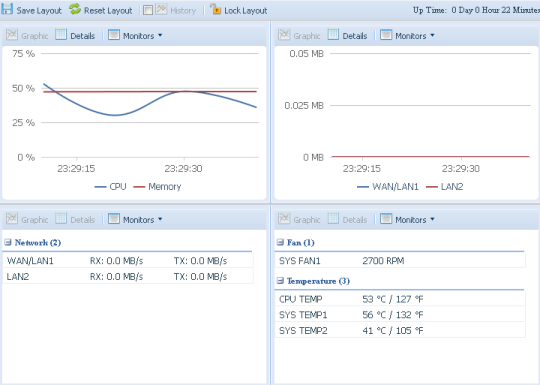 All this information is available in the “General”, “Status”, ”System Monitor” and “Hardware Information ” points of the “System Information” group. 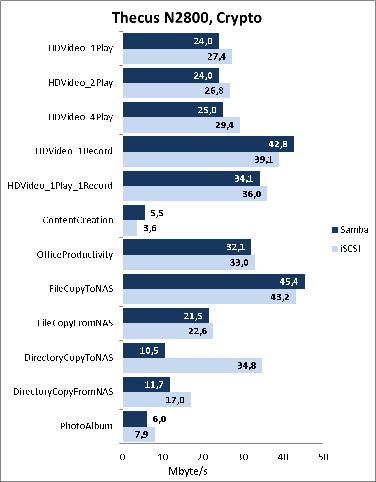 Information about installed hard drives can be obtained with the help of the “Disc information” item of the “Storage” group. The Thecus N2800 network storage can perform the functions of an NTP-server allowing other devices in the network to synchronize with it. 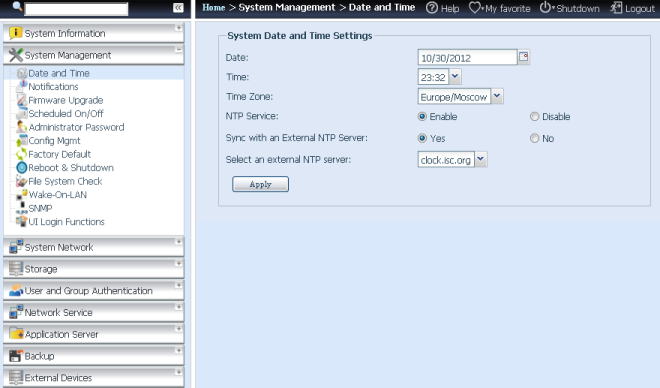 The corresponding setting is available in the “Date and Time” menu of the “System Management” group. Traditionally, Cyrillic names for an external NTP-server aren’t supported. 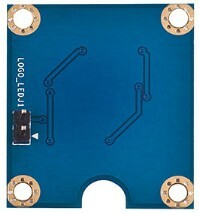 The device can be switched on and off on schedule or remotely with the help of the WoL (Wake on LAN) technology. 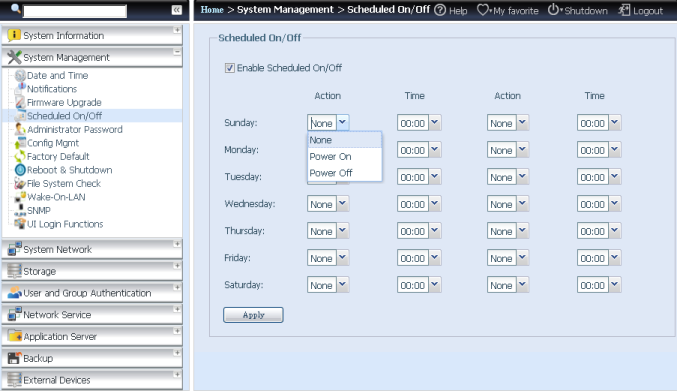 The corresponding configuration can be made in the “Scheduled On/Off” and “Wake-On-LAN” points of the “System Management” group. 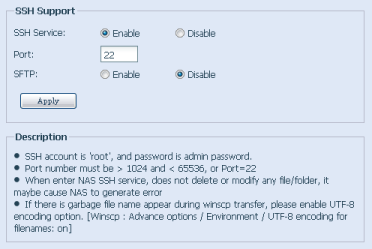 The “SNMP” point of the same group allows administrators to manage the storage remotely from the net with the help of the same-name protocol. 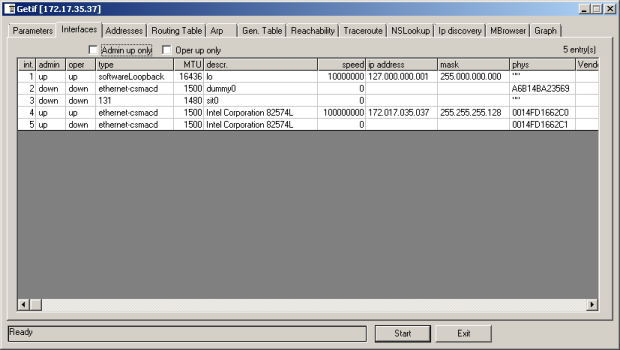 IP-parameters are configured in the “Networking” item of the “System Network” group. The ThecusN2800 network storage supports simultaneous operation both in IPv4 and IPv6 networks. 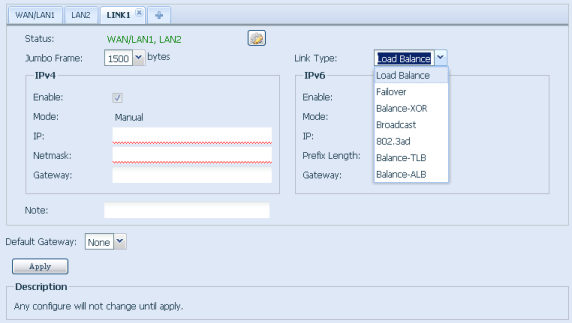 Also, N2800 allows grouping two physical interfaces into one logical one (the “Linking Aggregation” point of the same group) for load balancing or for providing fault-tolerance. Although the function of channel aggregation is more characteristic for corporate storages, it seems that the vendor decided not to remove it from the firmware, especially if to take into account the fact that flash-cards where firmware images are stored are getting cheaper and cheaper. 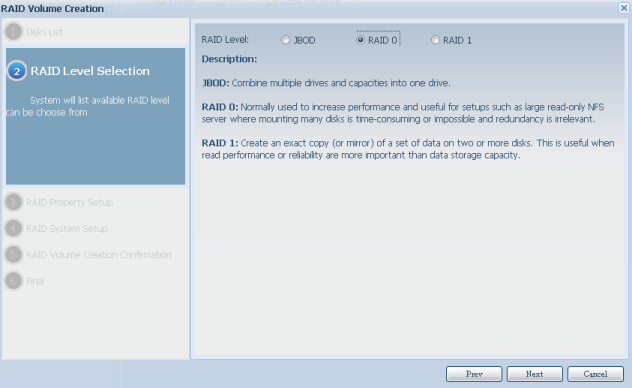 The device at hand allows creating the following RAID types: JBOD, RAID0 and RAID1; also, it supports the EXT3, EXT4 and XFS file systems. 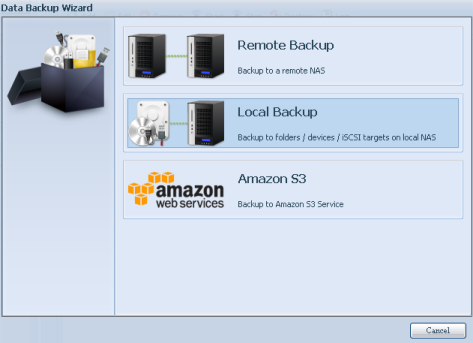 The administrator can find the corresponding settings in the “RAID Management” point of the “Storage” group. 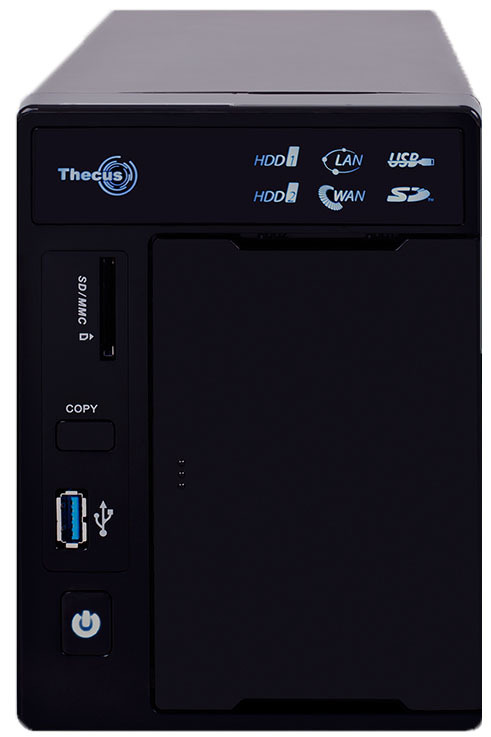 Thecus N2800 gives access to its own disc resources via the iSCSI protocol and also allows connecting remote systems thus virtually extending disc space available to the user. 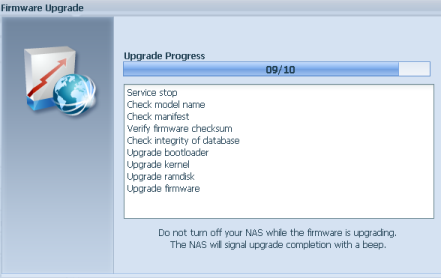 These things are configured in the “iSCSI” and “NAS Stacking” points of the same group. 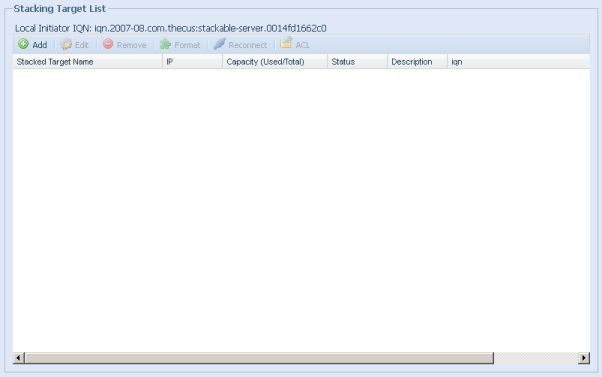 Active Directory support is also present in the Thecus N2800 network storage. 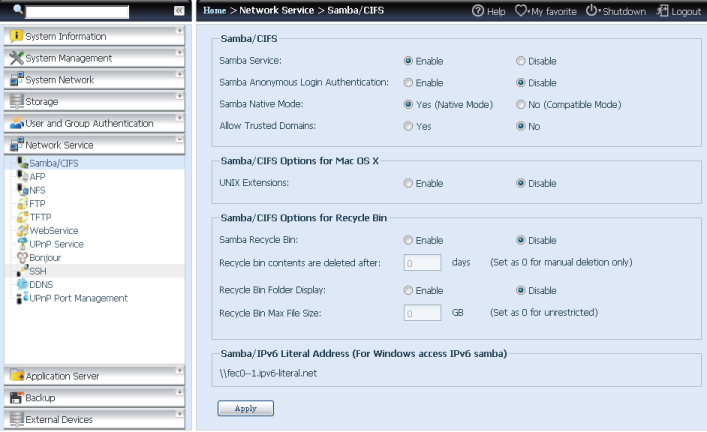 Samba, AFP, NFS, FTP, TFTP, UPnP, Bonjour, SSH and DDNS network protocols are administered with the help of the corresponding items of the “Network Service” group. 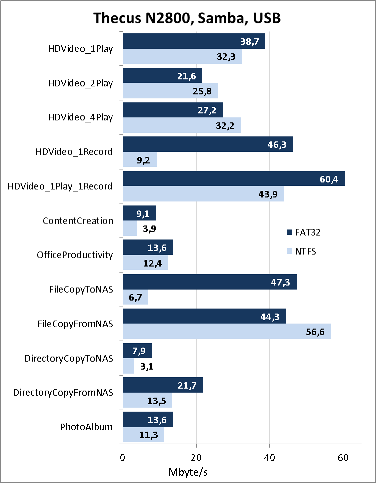 Functions responsible for making backup copies and restoring important data are gathered in the “Backup” group. 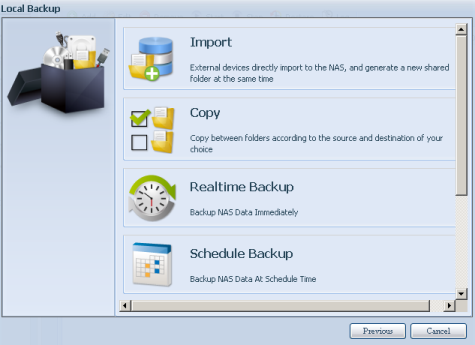 It’s worth saying that it’s possible to make a backup copy not only for user data but for the system itself as well as for access lists to different file system objects. Despite the presence of the system backup function, in fact it’s impossible to make this backup copy because N2800 has only one flash-memory module; however, it will be very much in demand for higher models which work with the same firmware. User data can also be copied to a DVD if a DVD-ROM is connected to the device USB-port. The ThecusOS operating system allows connecting printers and allows users to manage local and remote UPS units. The corresponding settings are gathered in the “External Devices” menu. Here we’re through with studying the features of the device web-interface and are turning to its command line. Access to the command line is permitted with the help of the “SSH” point of the “Network Service” group. 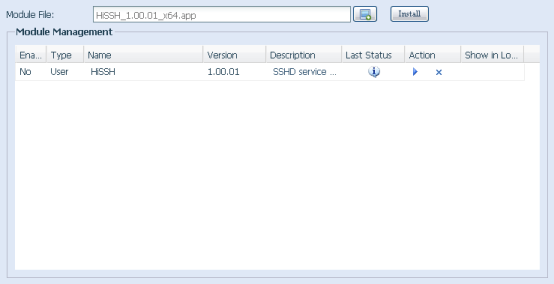 If for some reason it’s impossible to use standard access via SSH, one can install an additional HiSSH module with the help of the “Module Installation” menu of the “Application Server” group. No matter what access mode was used, the administrator gets to the command line of the device operating system. Let’s study some of the abilities it gives to the user. BusyBox v1.16.1 (2012-09-20 11:41:59 CST) multi-call binary. It seems that Thecus software developers favor RedHat very much. We’ve already seen the same operating system in N8900 and N16000. With the help of the ps command let’s see what processes are running on the device at the moment. We put the result of this command operation as well as the contents of the /proc, /bin, /sbin, /usr/bin and /usr/sbin into a separate file. 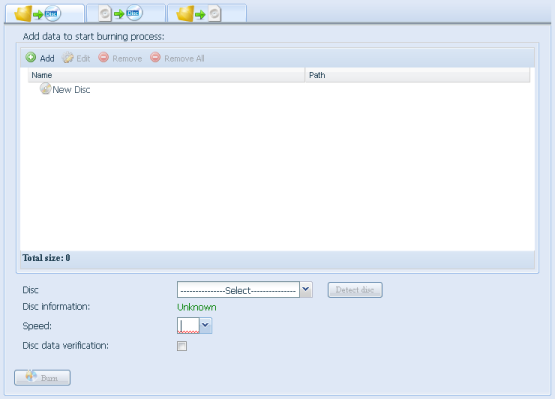 The top utility displays data on the current operation of running processes. Now let’s move to the /proc catalogue and find out the operating system uptime, its average load, get information about the installed CPU and amount of RAM. 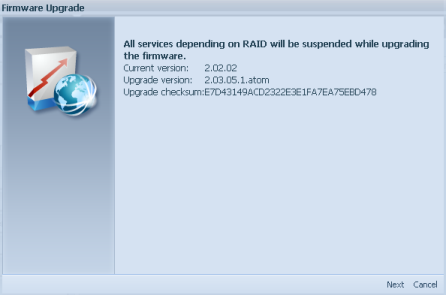 Also, information about the system load can be obtained with the help of the /usr/bin/uptime utility. We deleted information about CPUs 1, 2 and 3 as it repeats what is given for CPU 0. To find out the list of supported file systems and encryption types one has to turn to the following files: /proc/filesystems and /proc/crypto. We decided to present the contents of these files separately. 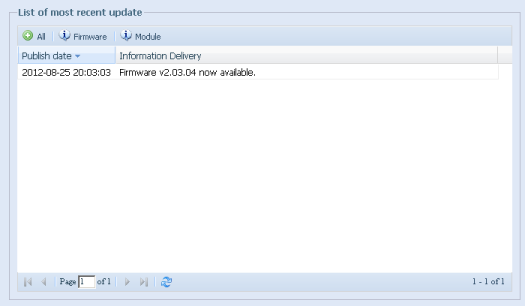 The /app/version file contains information about the firmware version. Here the brief review of the command line interface is over and we’re moving on to studying SNMP access. Besides the web-interface and the command line the Thecus N2800 network storage also provides access for monitoring via SNMP. 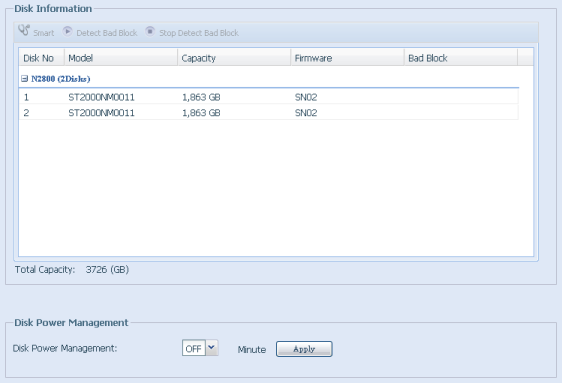 The corresponding settings are available in the “SNMP” point of the “System Management” group. To get access via the same-name protocol we used a simple utility Getif version 2.3.1 the Interfaces tab of which displays information about the storage network interfaces. 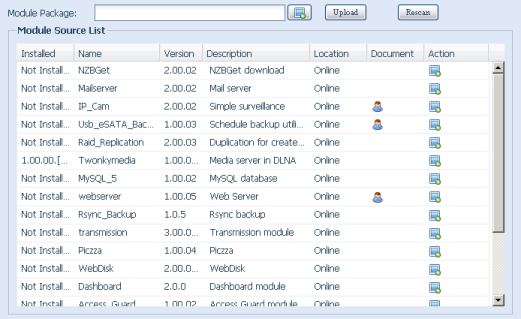 The Mbrowser tab gives the administrator access to all other entries. Unfortunately, the vendor doesn’t provide users with any utility to work with network storages via SNMP, consequently, we added the device to our test monitoring system based on Cacti. 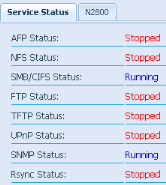 On the plot below is the network interface load at the moment of N2800 configuration. 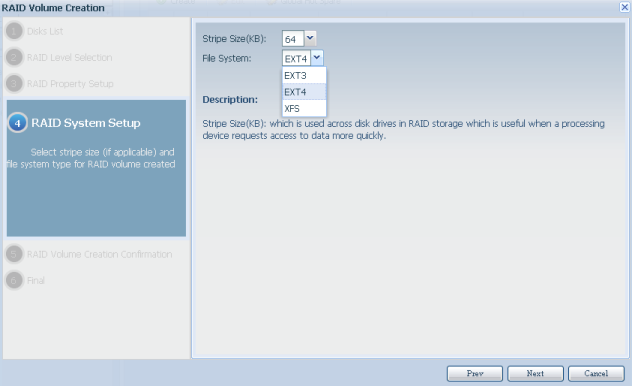 Here we’re through with the brief review of access to the storage via SNMP and are moving to actually testing the device. The first experiment we always hold is measuring the device booting time under which we mean the time interval between switching power on and receiving the first echo-reply via ICMP. Thecus N2800 boots in 37 seconds. We consider it to be an acceptable result. The second traditional test is checking the device security, which we run with a standard device configuration with a created RAID. Altogether we discovered nine open ports: TCP-80 (HTTP), TCP-111 (RPC Unix), UDP-111 (RPC Unix PortMapper), UDP-137 (NetBIOS Name), TCP-139 (NetBIOS Samba), TCP-443 (HTTP SSL), TCP-445 (Microsoft DS), TCP-631 (HTTP) and TCP-3260 (iscsi-target). The most interesting data are below. Everything could be fine were it not for some suspicions of insecurities in the PHP code. 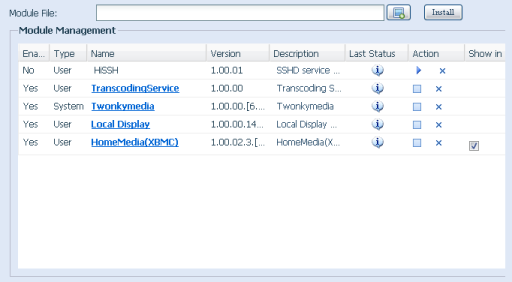 Of course, we didn’t forget about the function of a media-player that is implemented in the N2800network storage. This model is equipped with an HDMI port with the help of which the device can transmit images and sound to a modern TV, home cinema or any other player. To start working with HDMI one has to install add-ons. For instance, with the help of the LocalDisplay add-on the user can display an image on the screen; however by default the only available things will be a browser and a command line to manage the NAS. 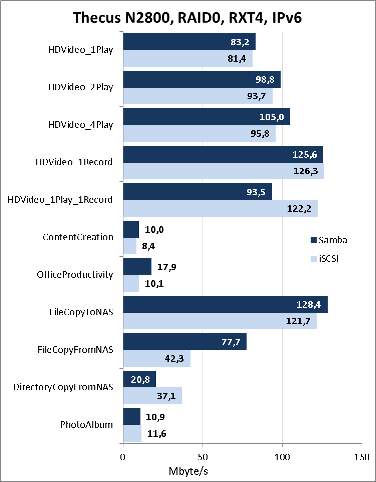 To see media-data on the storage you’ll need another module – XBMC. Unfortunately, not everything went well – on our Samsung LE40R82B television the displayed picture was displaced relative to the center and its size didn’t match the visible area of the device. When we were watching films sometimes the picture fell apart and we even managed to hang the device a couple of times. We hope that further versions of the modules at hand will be free of these problems. What we now have in store are arguably the most expected experiments – performance tests to run which we used the Intel NASPT utility 1.7.1 and a personal computer the parameters of which are below. We would like to specifically mention that before the measurements we intentionally decreased the amount of RAM to reduce cashing by the local node (in accordance with developers’ recommendations). 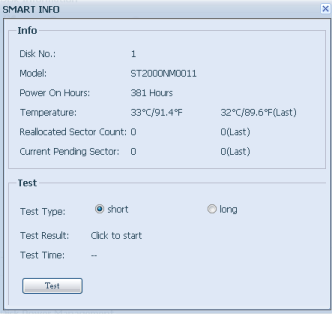 For testing we used Seagate Constellation ES ST2000NM0011 hard drives. 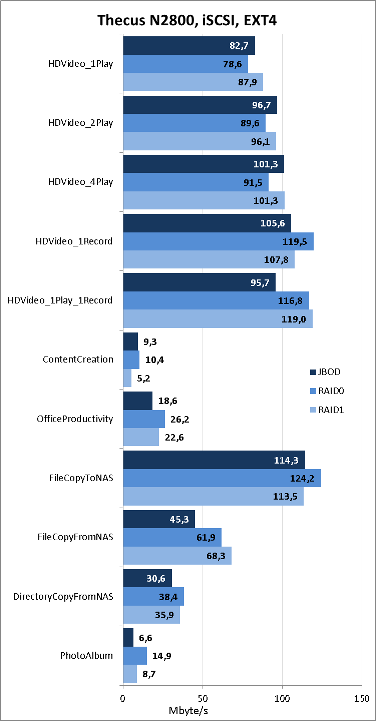 First, we tested RAIDs’ performance (JBOD, RAID0 and RAID1) with the default file system (EXT4). It’s worth noting that we excluded the DirectoryCopyToNAS test results from the diagram below because they were quite inadequate. 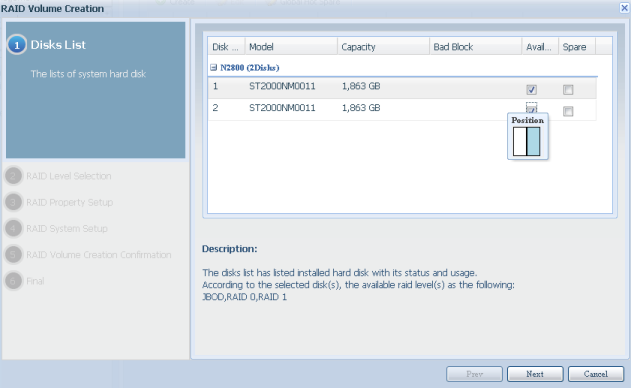 Then we decided to find out what different file systems with a RAID0 are capable of when accessed via SMB and iSCSI. Also, we didn’t forget about access to data located on external devices for which we chose a Transcend StoreJet 25M3 hard drive with USB 3.0 interface. Data stored on N2800 can be encrypted, which allows making them unusable in the case of the storage and/or discs loss or theft. 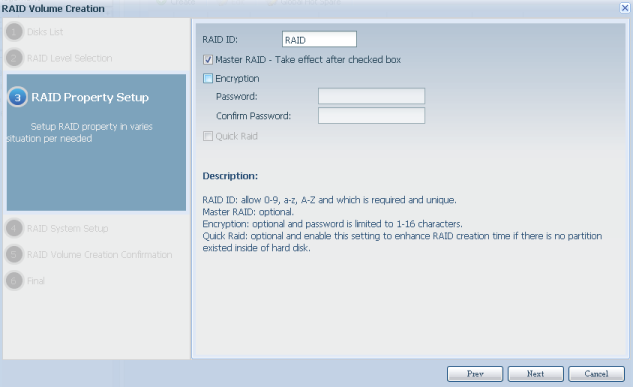 Access rates to encrypted data (RAID0, EXT4) are presented on the diagram below. The Thecus N2800 network storage also supports IPv6. However, we have to say that whenever we switched it on in the web-interface we immediately lost access via iSCSI over the older version of this protocol – IPv4. Naturally, we reported this problem to the vendor. Here we’re through with the testing section and are going to make conclusions. 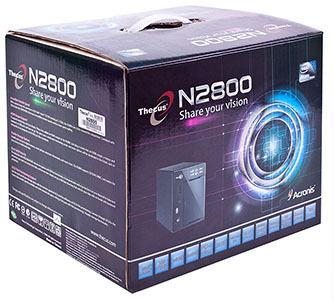 We were quite content with the Thecus N2800 network storage that we tested. 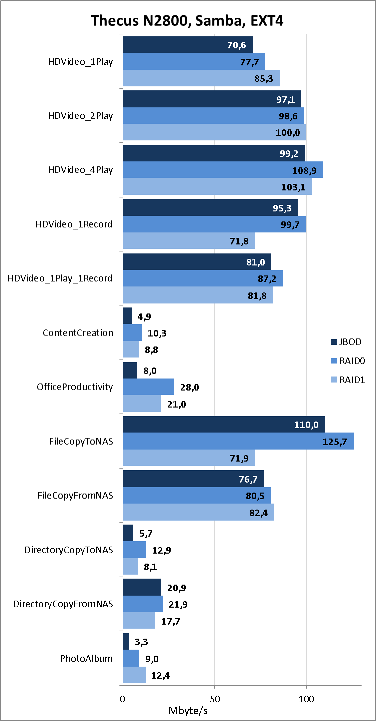 It showed the best performance results among two-bay storages that we’ve ever had in our lab. The feature of using this device as a media-player also adds to its attractions. The advantages of N2800 are listed below. Unfortunately, some disadvantages are also present. When the article was being written the average price for Thecus N2800 (without discs) in Moscow online shops was 15000 RUB. The author and the editorial staff would like to thank the Tayle Company – the official distributor of Thecus equipment in Russia – for kindly supplying us with the storage for testing.